Hey there! Hope you're all well. Today I decided to share with you, FIVE ways to wear my favourite shoes in my closet, Timberland boots. There are many versions of Timberland boots and Timberland look-alikes out there, and I recommend you get yourself a pair. They are timeless and incredibly comfortable! As you may or may not know, I like my dark colours. This means greys and blacks. In the second look, I have paired a grey top with a black leather-look biker jacket for that extra edge. The blue jeans make the outfit colourful, and the rips in the knees show a bit of skin and are a fun little touch to the basic jeans. whole belly-button movement, but a little midriff doesn't hurt. These high-waisted leggings are leather-look to make the outfit a tad bit more interesting. And because the red top is cropped, I opted for long sleeves to cover up a bit. A simple necklace completes the look, and you're ready to go! Last but not least, CAMO! I bet you haven't seen camouflage since 2006, but it's starting to make a comeback! Because the jeans are a little wild, I kept everything else simple, with a black tee and a biker jacket, for a bit of femininity. 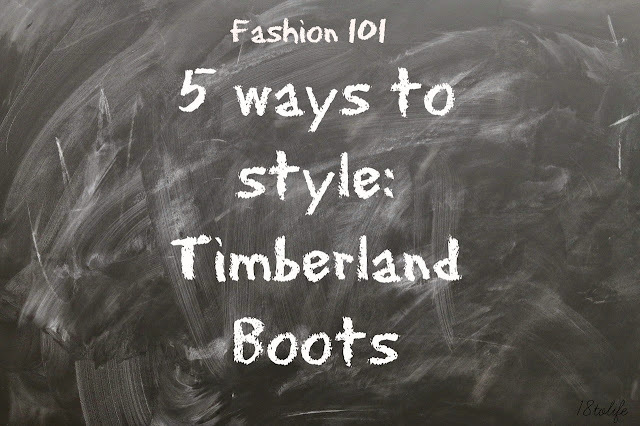 So, those are 5 ways you could style your Timberland boots, and how I have worn them before! I hope you found that useful! I like number 1 the best haha.